A welcome addition to the Bic Marking family, these retractable markers bring one-click convenience to craft, home, and office projects. From marking a child's lunch bag to labeling a plastic storage box, Bic Marking Retractable Markers make bold marks that last. The fade-resistant, acid-free ink is permanent on most surfaces, including paper, glass, metal, photos, foils, coated paper, and most plastics. 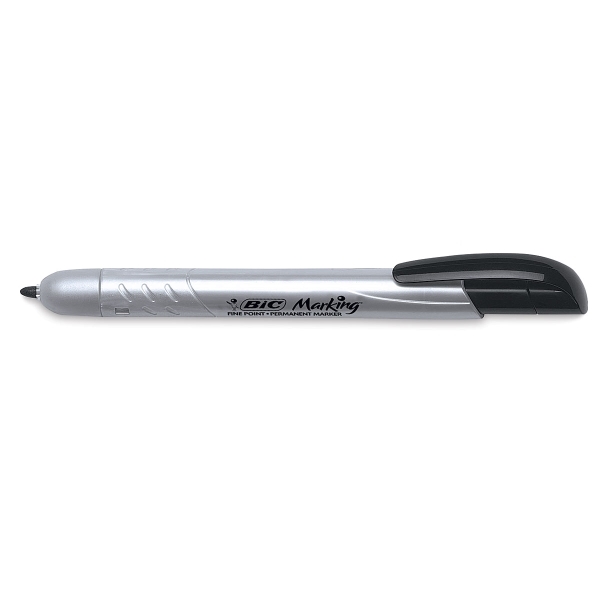 An ultra-comfy rubber grip lends comfort and control, and the bullet nib is suitable even for fine marking. When you're done, simply click the end to retract the marker nib. ® BIC is a registered trademark.® Marking is a registered trademark. Note — The name of this product is now Bic Marking, previously called Bic Mark-It.The product and Bic quality remain the same. You may receive a product that displays either of these names.